We are recognized as one of the leading manufacturers, exporters and suppliers of superior quality range of Inflatable Volleyballs which comes with four lining, the offered Inflatable Volleyballs are available in numerous thickness & sizes accordingly to the needs of customers. These Volleyballs are manufactured of finest grade rubber which ensures its superior quality. With an aim to fulfill varied requirements of our valued clients, we are engaged in offering White Volleyball. The offered volleyball is processed using the approved PU synthetic materials at our well-maintained processing unit. 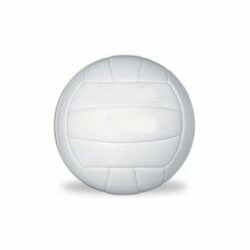 This volleyball is comprised with extensively used to provide glossy and shiny finish. Moreover, the offered volleyball is made available in size 4. In addition to this, the offered volleyball can be purchased from us at industry leading rates. We are one of the noteworthy enterprises engaged in offering superior quality Leather Pasted Volleyball. This volleyball is manufactured using pasted leather material. The offered volleyball paint is manufactured adhering to sports industry norms. During the fabrication process, our professionals keep a scrutinized eye on the production to avail perfect volleyball. 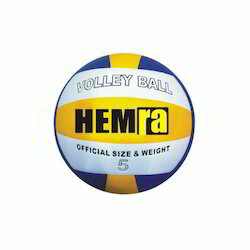 This volleyball comes with the thickness of 1.20m. Additionally, the product is also made available at nominal rates. Water/Moisture Proof For Extra Durability. We are counted amongst the recognized organization offering of premium quality Synthetic PU Volleyball. At our state-of-the-art processing unit, this volleyball is processed by our adept professionals using eco-friendly synthetic PU materials and compounds. Due to its improved quality, this volleyball is widely demanded by sports authorities for tournaments. The super grip and appealing color are attraction of the volleyball. Our firm has gained continuous appreciation as the prime organization offering of PVC Volleyball. This offered volleyball provides hard, shiny and attractive finish. In addition with it, due to such specifications, this volleyball is widely used on the outside surface of the volleyball to make the structure appealing. The offered volleyball is processed in our well-maintained processing unit using quality-approved materials and innovative methodology. Bestowed with an ingenious team of designers and advanced production unit, we have been able to introduce an exclusive range of PU Volleyball. 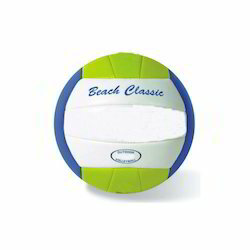 The provided volleyball has smooth, shiny and bacterial free surface. This volleyball is processed under the strict leadership of our professionals using harmless PU materials with the help of progressive methodology. 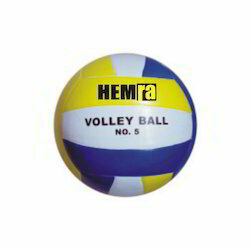 Moreover, this volleyball can be purchased from us at market prices within promised time. Looking for Inflatable Volleyballs ?